Leizhan high efficiency tissue production machines can use waste paper(like OCC, LOCC, AOCC ),virgin pulp as raw materials to produce high quality toilet paper, finished products can be small roll and jumbo roll tissue, napkin tissue, facial tissue, kitchen towel, etc. 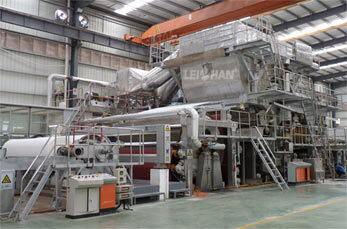 Leizhan specifically designed facial tissue paper roll manufacturing line can be divided into two parts: facial tissue paper pulp processing line and paper making line. Machines required in the facial tissue paper pulp processing line include: pulping machine(D type hydrapulper, Vertical hydrapuper, etc. ), cleaning machine(high density and low density cleaner), screening machine(mid consistency pressure screen, vibrating screen, low pressure screen, etc. ), and some other paper pulping equipments like pulp chest agitator, fiber separator, double disc refiner, etc. Leizhan high speed tissue paper manufacturing machine has a basis width range of 1575-3600mm, the tissue paper making project can produce 5-50 tons of facial tissue paper per day, using commodity wood pulp and white shavings as raw material. It has a basic weight range of 13-40g/m2 and the design speed range from 180m/min to 800m/min.